This project. designed by Architects EAT and located in Canterbury, Victoria, involved the restoration of an existing Edwardian house, minor demolition of the rear, with new addition suspended above the ground on columns. 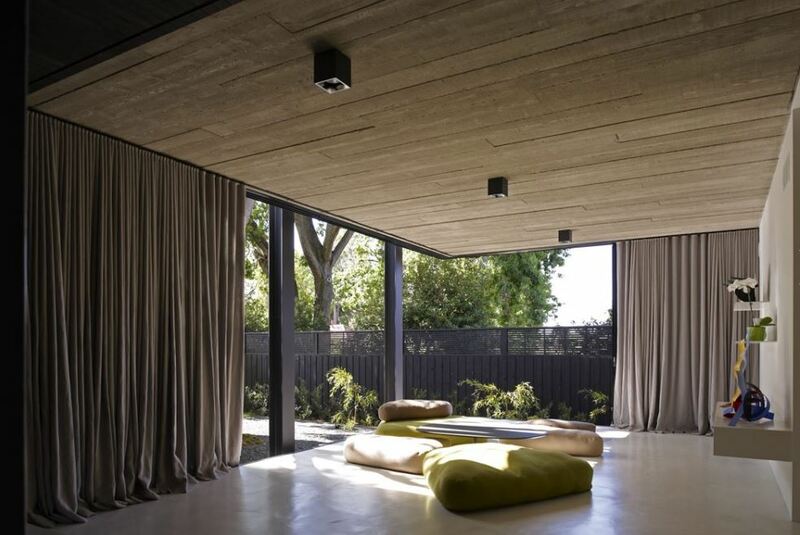 The construction, completed in 2010, took 18 months, and won the 2010 Royal Australian Institute of Architects Victorian chapter award for residential alternations and additions. In cannot have been easy for the Architects to successfully merge together the flat-topped, rectilinear pavilion of his addition with the existing hip-roofed Edwardian building. The transparency and openness of the new addition is a deliberate contrast to the darker, more enclosed design of the original house. 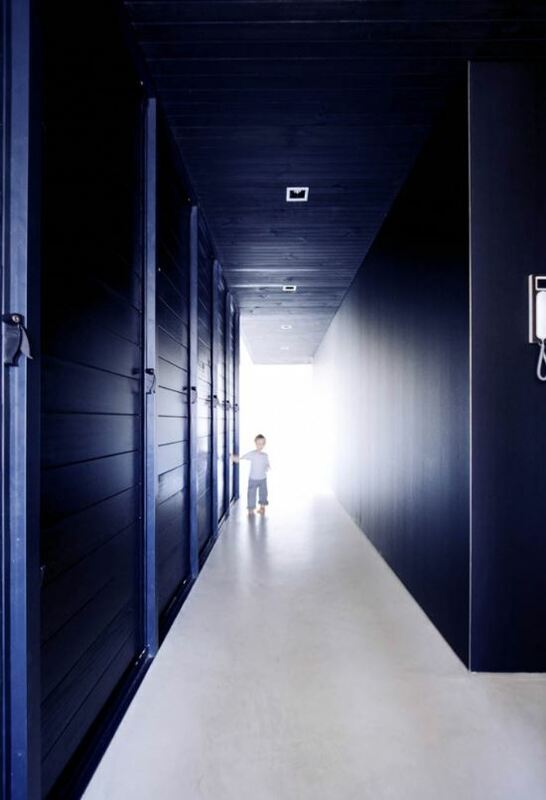 The link between the old and new is merged into the layering of spaces where inside and outside becomes one. Boundaries between the house and the garden have been blurred. The house is more a part of the garden than a separate space. The cantilevered floor plate becomes a garden seat. The dining area more garden pavilion. The architect’s design was impacted by the constraint presented by two mature Elm and Willow trees. Their response was a U-shaped plan enclosing a north-facing courtyard. The concrete floor and roof slabs are supported above the ground to avoid damaging the trees’ roots. 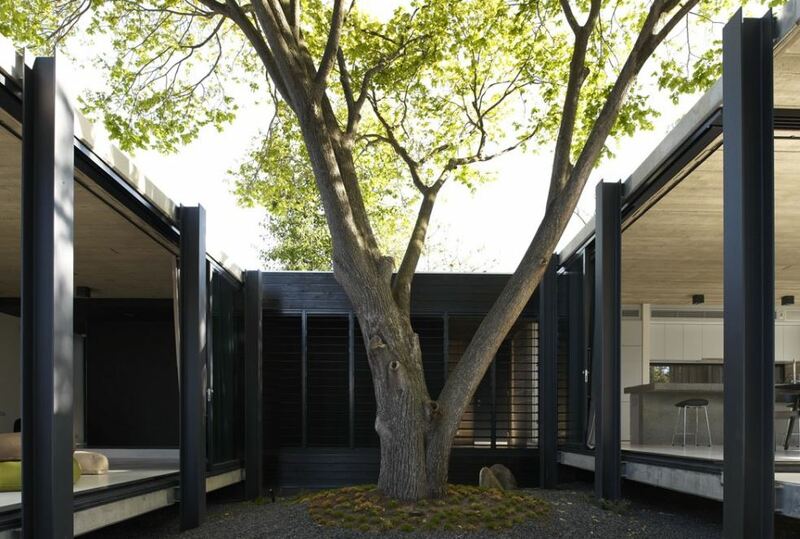 The structure encloses a north-facing courtyard around one of these trees, while sliding glass panels form a skin around the new rooms. 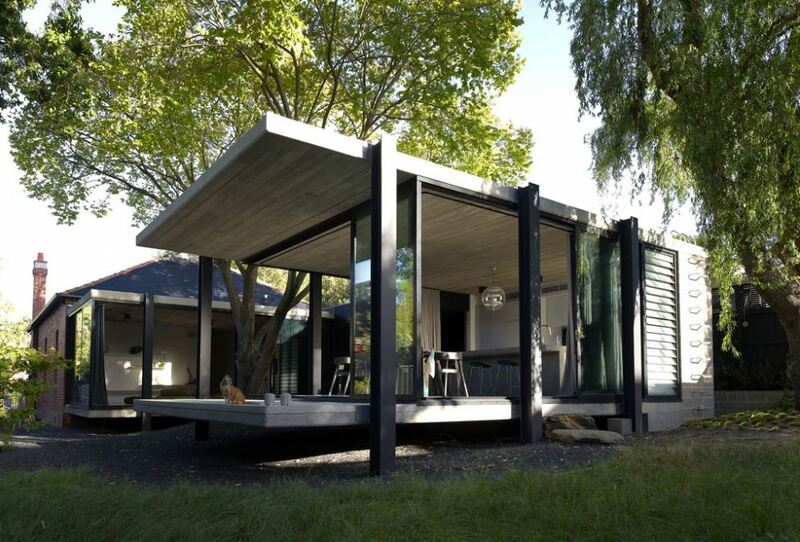 The project is said to evoke a certain reference to Mies Van der Rohe’s Farnsworth House built in 1951 and many courtyard houses in Melbourne by modernists McGlashan and Everist. 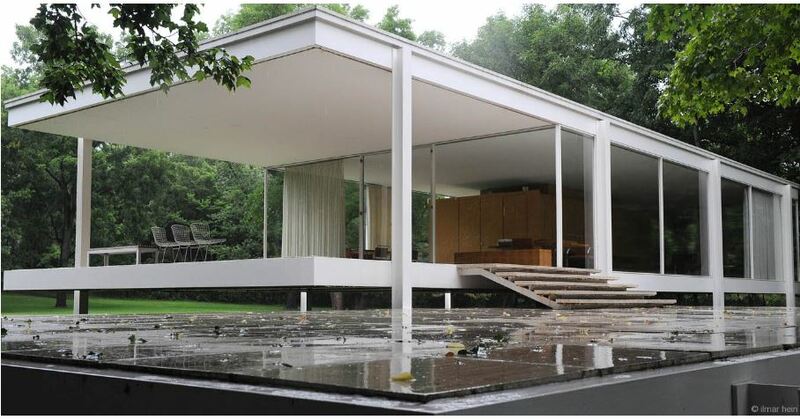 The architects concedes some similarities with both, stating that “We were really conscious of the similarity to the Farnsworth House but we had our reason for doing it,” …”Where Mies had the issue of flooding on the site, our platform raising was about protecting tree roots.” Image of Farnsworth House below. 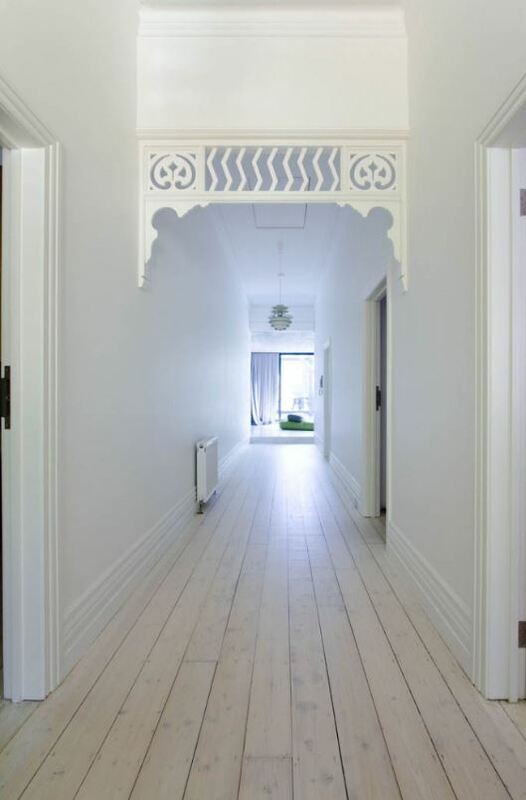 The older part of the house is unified by a whitewash all over compensating for the typically dark corridor and providing a connection between the period detailing. 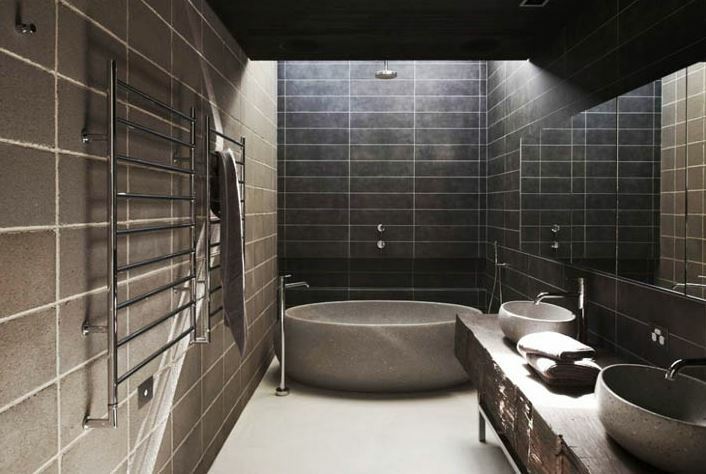 The white is a sharp contrast to the black paint and dark tiles in the extension. Solid timber louvres can be closed completely to create a striking dark corridor or opened to the garden. The living rooms and kitchen have been placed at the rear. The architect explains how “in keeping with the couple’s interests, the living spaces are non-traditional in the sense of being relatively “un-programmed.” Instead of a living room with a television, they deliberately decided to have just a couple of low seats. It is a very environmentally friendly design. The rear addition has a passive ventilation system, whereby louver windows promote cross ventilation. The building materials used are non-toxic and from renewable resources. 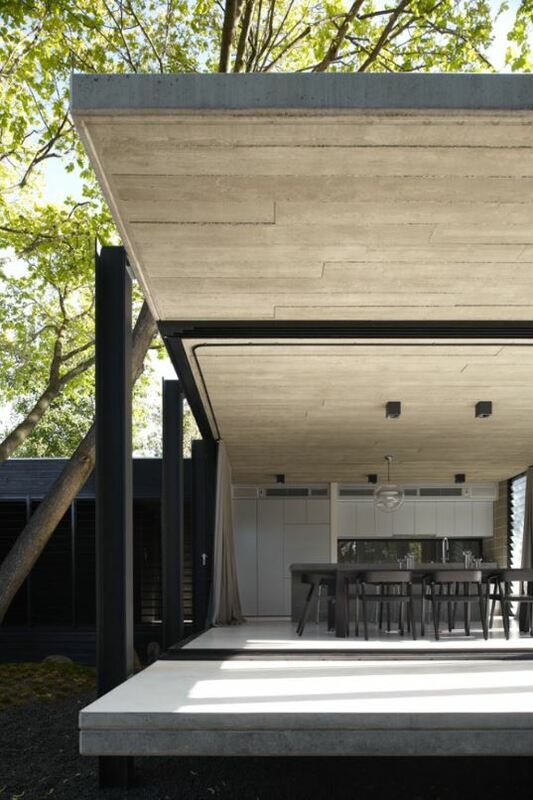 The concrete structure provides thermal masses to the house with the slabs further insulated to minimise heat loss. All windows are double-glazed, and the deciduous trees provide essential shading to the house during summer. Energy and water-saving fittings have been used throughout, and rain water is harvested for use in the gardens. A new carport with grid-connect solar power panels is in the design process. 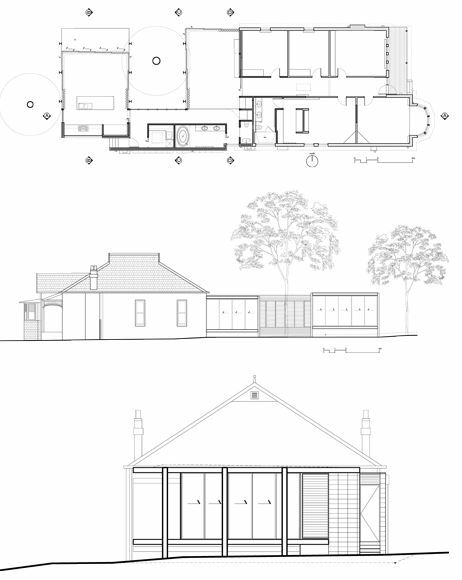 A new design for an old dwelling that references a modernist classic. MHM Loves!. Credits: Architects EAT website, Marcus Baumgart, 'Profile: Architects EAT', ARCHITECTUREAU: http://architectureau.com/articles/albert-mo-eid-k/, October 1 2010.